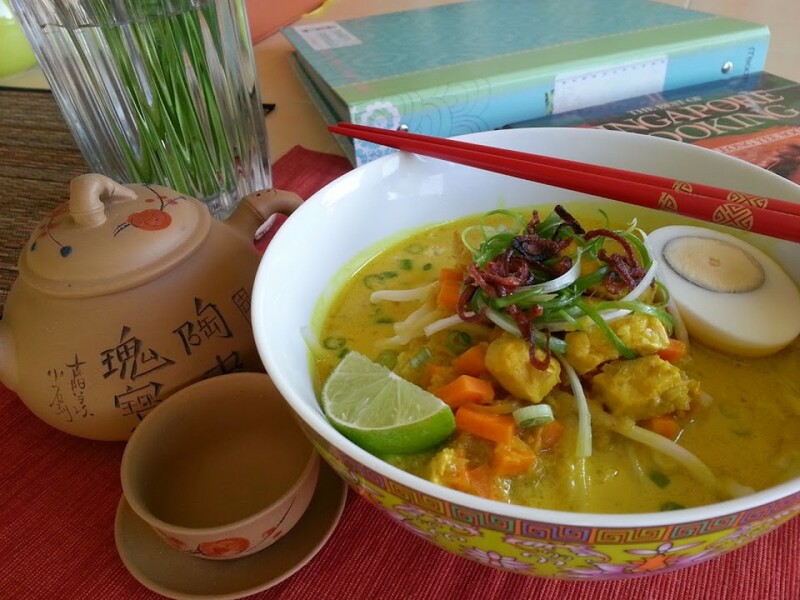 Chicken noodles in rich, spiced coconut soup. Top it with hard boiled eggs, fried shallots, and a squeeze of lime juice to make a delicious soup to go with jasmine rice. Heat coconut oil in a pot over medium heat, add in the spice paste. Fry until spice paste is fragrant and turned light brown and separate from oil. Add chicken breast and fry for another min until almost cooked. Add in chicken broth, coconut milk, lemon grass strips, and water; heat to a boil. Cover and lower the heat and simmer for 30 minutes. Add salt to taste. Meanwhile,in a separate pot, cook noodles according to package instructions, and blanch beansprouts and cabbage. Divide the three ingredients in large soup bowls. Add hard-boiled eggs, chopped spring onions. Turn off the heat on the soup, stir in the tbsp of lime juice. Ladle the hot chicken broth into the bowls. Top with shredded green onions, fried shallots. Serve hot with lime wedges and jasmine rice.